The EPL-22BS-1X150LED-100 portable explosion proof LED light from Larson Electronics provides operators with an easy to maneuver LED work light for use within hazardous locations. 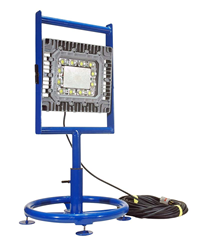 This portable fixture is comprised of a 150 watt LED light head that is mounted atop of a circular base stand that can be easily passed through openings 22” in diameter or larger. The LED light head produces a brilliant flood pattern of light that is ideal for illuminating enclosed areas and hazardous locations where flammable vapors, gases and dusts may be present. The LED lamp head is T5 temperature rated and retains 80% of its lumen output after 60,000 hours of use. The explosion proof LED light head in this unit features multiple LED drivers which help to increase the operational life of the fixture. With traditional LED lights, in the event an LED array or driver fails, the entire fixture no longer illuminates. This new series of LED lamps contains twelve LED boards configured in a series of banks. Each bank contains two LED boards with an individual driver. In the event of a driver failure, only one bank of LEDs will be affected while the other banks will continue to operate. In the event of an LED failure, the mating LED will continue to operate. The lamp can be easily adjusted up or down 90° and locked into position by loosening the two hand screws located on the side of the light head. Once the light is in the desired position, the operator then tightens the screws back to set the position. The light head can be swiveled 360° as well as completely removed by loosening the T handle at the base of the fixture and then re-tightening it. Included with this portable LED light is 100 feet SOOW cord terminated in a 1523 explosion proof straight blade plug. This unit is multi-voltage capable and can be configured to operate on 120-277 volts AC. For added protection to the lens, it is shipped with 25 peel off mylar over-spray lamp protectors. Larson Electronics carries and extensive line of LED lights, boat lights, intrinsically safe LED lights, LED blasting lights and explosion proof lights. You can view Larson Electronics’ full line of industrial grade lighting by visiting their website at Larson Electronics. Larson Electronics can be reached directly by calling 1-800-369-6671 or 1-903-498-6636 for international inquiries.